Juicing has a variety of health benefits that can greatly enhance your energy level and your overall quality of life. Maybe the most obvious benefit is the convenience of it. Yes, it takes some effort to clean a juicer, but any amount of time spent cleaning is usually a fraction of the time it would take to cut that fruit up or prepare those vegetables separately. Another benefit to juicing is that it enables me to get all of the nutrients I need for a day in one simple serving. One of the things I love the most about juicing is the ability to use a wider array of ingredients than I would otherwise use. Even on days when I have a limited amount of time, it provides me with an easy, convenient way to experiment with different combinations and recipes while ensuring that I am able to reap the many health advantages of getting the nutrients I need. When juicing, I use organic kale, spinach, celery, ginger root, cucumber, lemon, and beets as my main ingredients of choice. There are many benefits I get from using these fruits and vegetables, not the least of which is the nutritional value. Having greens in your diet is critical, and although they are not the only way, they are the best way of getting many of the nutrients your body needs. Getting the nutrients you need may help to limit or even eliminate your cravings for less healthy choices in your diet. Fruits and vegetables are tremendous sources of vitamins A, C, E, and K, as well as other nutrients including calcium, iron, magnesium, manganese, phosphorous and potassium. Greens, in particular, are an incredible and natural source of powerful antioxidants that aid your immune system in fighting illness and infection. The best part of juicing, in my opinion, is the ability to get all of this in one drink. One often-overlooked factor when it comes to juicing, is the type of juicer that is used. The two primary categories of juicers are masticating, which crushes the ingredients, and centrifugal, which grinds and cuts up the ingredients. I prefer a masticating juicer over a centrifugal juicer for several reasons. The centrifugal juicer is faster than the masticating juicer, but the juice that comes from this type of machine loses some nutrients during the juicing process and spoils faster due to the process of oxidation, which is essentially oxygen being absorbed by the juice during the high-speed processing used by this type of juicer. Masticating juicers, although not quite as fast, use a method similar to chewing the fruits and vegetables to remove the juice, which enables it to effortlessly process tougher fibers such as spinach, kale, and parsley. The masticating juicer, although commonly more expensive than a centrifugal juicer, is easily worth the extra cost when these key factors are considered. Juicing is an investment in how you want to feel today and your wellbeing in the future. There is no more important asset than your health and the more dedication you devote to promoting this asset the better off you will be. Sometimes it’s hard to get all the vegetables you need in your diet, whether due to time constraints or otherwise. Whatever the reason, juicing is a solution that is simple and efficient. As hectic as life can be, it’s nice to have something that helps us keep up so we can live the life we want to live rather than our life dictating that for us. Is juicing healthier than eating whole fruits of vegetables? 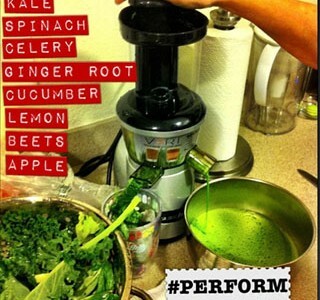 2 Responses to "Get Your Greens: The Facts Behind My Juicing"
Such a clean, elegant blog. Thanks for modeling what it can be. The views I have read here about motivation and nutrition are so true to my own experience. It was good to find you! Don’t forget to get your fiber…something you can do with the pulp that comes from your juicer is to bake it into muffins (fruit and veggie pulp), or even use it in an omelet (veggie pulp).